So are Grain elevators no longer in demand? What replaced them? Ag. commodities trading, hedge funds, grain futures, global industrial agriculture, surplus grain exports trade agreements, etc. chingon wrote: Ag. commodities trading, hedge funds, grain futures, global industrial agriculture, surplus grain exports trade agreements, etc. None of those things actually store grain. Are you saying efficiencies from these players have reduced the need for storage? they need a sheltered transit center (perhaps at burlington & armour) that could serve as a single stop for all of the bus routes that pass through NKC. they already have bus lanes. I'm surprised it took so long for this to get mentioned here. They've already started tearing down the shell, from what I heard a little while ago it's almost gone. I hope the huge scar isn't left here too long. On another note, I just noticed that I started this thread way back in 2004. It's mind boggling to think of how much of what NKC is known for didn't even exist in 2004. I hope they have insurance that will pay to replace the building. I think this may be the time to introduce some residential into downtown NKC. Especially in that area with CVS across the street, a few breweries a block away, the nearby restaurants, etc. I think an apartment building similar to 1914 Main would do quite well there with ground level retail of course. KCLover wrote: I think this may be the time to introduce some residential into downtown NKC. Especially in that area with CVS across the street, a few breweries a block away, the nearby restaurants, etc. I think an apartment building similar to 1914 Main would do quite well there with ground level retail of course. There was a rumor a while back of a plan (that I think died) to build a garage with apartments on top on the city parking lot at 18th & Swift. This corner might be even better for such an idea. Downtown NKC already has residential inside it. If you've been through NKC as much as I have, the best place to put a mixed use building is along 18th between Burlington and Howell. flyingember wrote: Downtown NKC already has residential inside it. I agree and I more or less meant along the main drag (Armour Rd). There is no residential on that stretch of Armour except for Park Lofts (old Sears warehouse). I just think a nice, modern apartment building on the actual main drag and across from CVS would do well. 18th would also be great for some larger projects and to bring more constant activity south of Armour. I'd imagine the area of breweries and taverns around Chicken N Pickle would enjoy some added residents. Yes there is obviously a fair amount of residential within NKC city limits, most impressively Northgate Village's new urbanism across from Macken Park. But there is little if any residential along Armour or Swift in/near the heart of downtown NKC, and plenty of lots and attractive old warehouse space. Especially along Swift, it is still largely a functional light industrial zone, however. Would love to see increased residential along Swift. Super close to downtown! Skyline views from the roof! Finally a nice selection of bars, restaurants, neighborhood amenities! New welcome arch sign going up on Armour tomorrow. This explains the odd curb bumpouts they installed last month at Armour & Buchanan that didn't seem serve any useful purpose. "No one knows, who they were, or what they were doing." If you haven't been by to see it, the sign is huge. I like the mini model sitting on the median. It looks like a boot scraper. I flipped my wall calendar to December to write down an event and the illustration for next month was something I haven't seen before. 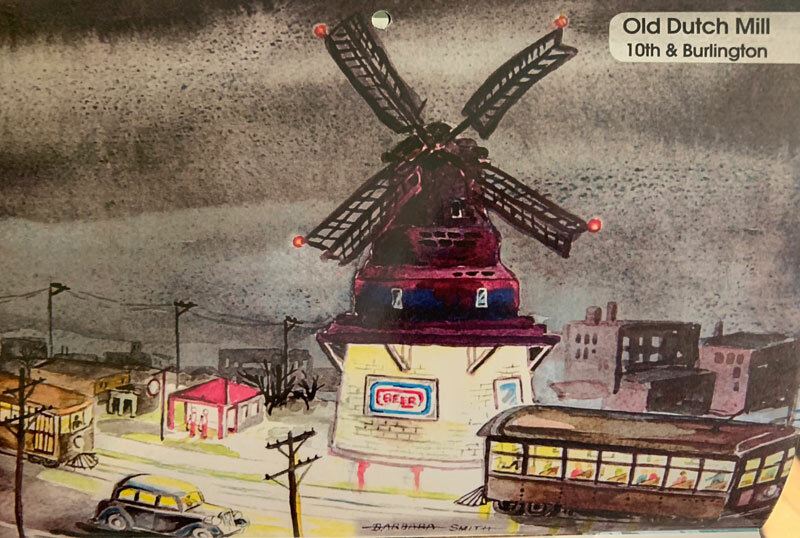 Anyone know anything about this gas station or have seen any actual photos of it? The only thing I could find in Google was a passing reference to it in an obituary. If the buildings in the background are real and not just something stylized, they must be long gone as I can't find anything analogous that's still standing. I'm also curious if this was located where the Valero is now, if it's where the park is now, or of it's a little further south and so possibly razed to make away for the HOA alignment. The streetcars on Burlington (I'm assuming that's Burlington, anyway) are a nice touch that I hope very much to see return sometime in the 2020s. Was at an amusements trade show in Orlando this past week and the Flowhouse folks were there. 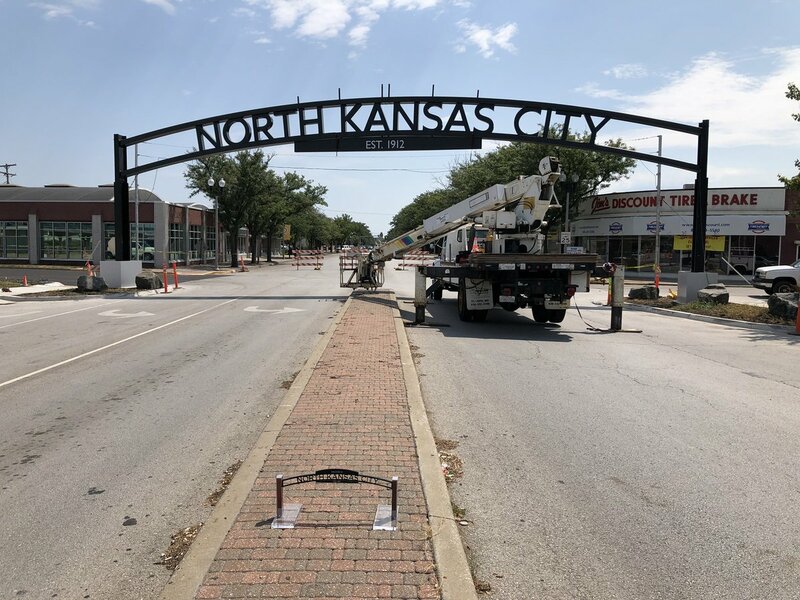 Chatted to them about the upcoming KC location for One North and virtually everything in there got pushed to a "late 2019" opening. Basically confirmed that they were still on since nothing has been done for a few months to the site.